Off the coast of Clyde River, Nunavut, unspoiled Arctic waters are home to 90% of the world's narwhals. These unique tusked whales play a crucial role in the aquatic ecosystem, and for thousands of years have been a staple of the local Inuit community. But now their very survival is in danger. The Canadian government just granted oil corporations the right to search for drilling sites in the ocean near Clyde River. Offshore drilling is bad enough, but the search is worse – these oil companies will use "seismic testing," setting off huge explosions underwater to try and find oil. Like all whales, narwhals use their hearing to communicate and to find their way safely beneath the Arctic ice. The search for oil will deafen, disorient, and kill any narwhals caught in its path. It's up to us to speak up now, and stop this while we still can. Save the narwhals! For generations, big corporations have stripped northern Canada of its natural resources, trampling the rights of native peoples and destroying entire ecosystems for profit. The government has been complicit in this, auctioning off oil and mineral rights to the highest bidder and ignoring the consequences. But until now, the narwhals and the local ecosystem they support have managed to survive. The people of Clyde River have had enough. 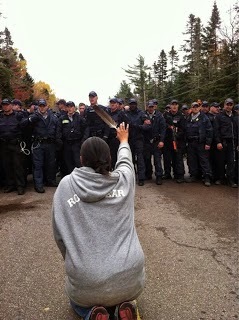 They are standing up to the government and to Big Oil and fighting to protect their home. But there are only 900 people in Clyde River. They need us to stand with them. If we act now, we can stop the oil companies in their tracks before the damage is done. Sign the petition to stop Big Oil from destroying Arctic habitats.